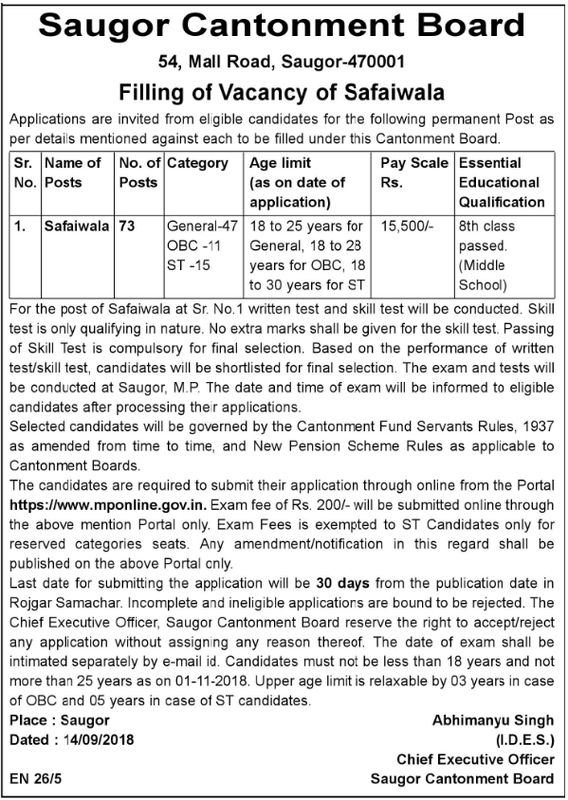 Saugor Cantonment Board Madhya Pradesh has advertised Employment News for Safaiwala posts. Before applying to this job, all Candidates are requested to read necessary information for this employment and apply only after that. No of posts: 73 Posts. Candidates must 8th pass is required to apply for this job. Candidates age should be between 18-25 (General) / 28 (OBC) / 30 (ST) years. Selection will be done on the basis of written test and skill test Performance. Application fees will be 200 (For Unreserved Category) / free (ST) /-. Note: For more information related to Saugor Cantonment Board Job Recruitment, you can see the published notice above through notification link and visit daily for updates of Indian government employment news.